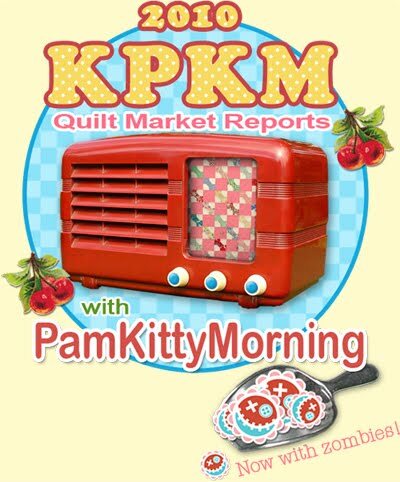 PamKittyMorning: Radio PKM Now with Zombies! Wish I was going to Spring Market this year! But I will see you in Houston, rooms booked, flight booked, see you there! Monica has some sweet button skills. Have loads of fun in Minneapolis! love the new button... too cute! Yay! Great button...and it's so fun to read all the market posts...especially for those who aren't going! YES! YES! YES! I will be there! Posted my link! Can't wait to see you!! Yay! It will be the next best thing to being there. You're just too smart! I can't wait to read all the posts. I guess this means I better hurry and finishing my sewing... and packing too! I have us linked up. 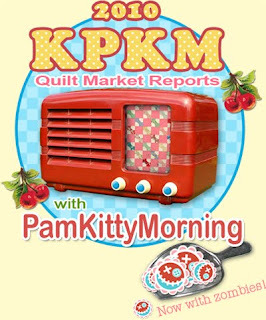 I'm new at blogging but not new at quilt market. Should be fun! We definitely like different things! Variety - yea! Put my link up - thank you! Hope to run into you at market. We are linked up and ready to go - well not fully packed yet. Traveling with Lindy Munday of Bearpaws and Hollyhocks. Packing the car today. See you soon. This was last on my To Do list...I'm off to Market now! 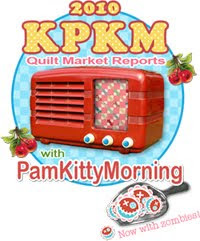 love your new bag & quilt life commentary. 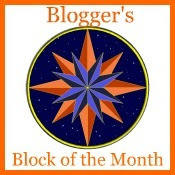 Sorry, will you deleted my blog? I hasn't understand it. So fun to meet-up (and rest our feet) in person. It may take me a few days to get these photos up, but I promise I'll get it done! Have our link up and posted. Thanks Pam. you are sooooooo cute! how come I only got to see you the first day? or maybe that was during set up? It's all a big blur! Thanks for the cool button! Sorry I am late to the party! I am a month late to the party here! Thanks for letting us link with you.